All Milburn homes currently listed for sale in Milburn as of 04/22/2019 are shown below. You can change the search criteria at any time by pressing the 'Change Search' button below. If you have any questions or you would like more information about any Milburn homes for sale or other Milburn real estate, please contact us and one of our knowledgeable Milburn REALTORS® would be pleased to assist you. 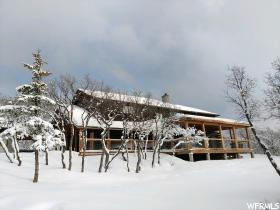 "Beautiful secluded property, amazing retreat in Milburn Ut. 5 min north of Fairview in Sanpete County & 45 min south of Sp. Fork In the heart of Utah. Deer & Elk Hunting, fly fishing nearby, ATV/snowmobiling trails nearby. 10 acres lie on the West face of the Manti Lasal Mtns with incredible views of the valley below. Home is a 5 bd/3 bth, Main floor has kitchen, bdrms, 2 bths & liviing room with french doors that open to a large west facing covered deck to enjoy the view & awesome sunsets. Solarium on the south is beautiful & functional as it creates an envelope home circulating heat from the sun and/or wood fireplaces (1 up, 1 down) to the upstairs from french doors. French doors downstairs do the same circulating cool air thru throughout house in summertime. 2nd floor has Large master bedroom, bath with tub & steam shower, wet bar, fireplace & 2 more bedrooms. One could easily be used as a den. There are numerous windows for more incredible views. Peace & quiet & scenery all around. Bring the horses, they'll love it. Sq. ft. is an estimates & provided as a courtesy. Accurate sq ft should be obtained by buyer thru appraisal, etc. Buyer to veryfy all info. Please provide pre-qualification before showing. "